I offered (nay, demanded) to be allowed to make a cabinet for my mother to fit into an oddly sized nook at her house. I have not been doing any woodworking of any sort recently and needed something to motivate me to do something. I figured that like bicycle riding "you never forget". Hah! The only proper wood for this would be a wormy sycamore similar to that from which I built her nightstand. My supply of this wood was tight but I guessed that there would be just enough to finish the project with nothing left over. This was overly optimistic since it depended on me making no mistakes. As it turned out, mistakes were found in abundance during this project. 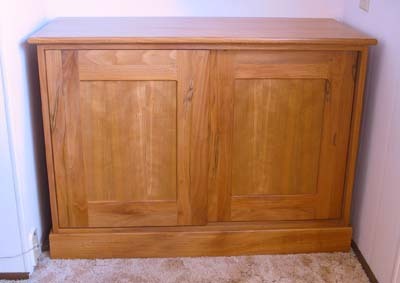 The cabinet is made from some locally harvested sycamore that I actually took part in sawing into lumber. After that I dried the wood in my basement. The tree the wood came from was standing dead and had been attacked by some sort of beetle which had left the sapwood massively mined by huge white grubs the size of my little finger. The majority of the sapwood was cut away and discarded leaving mostly heartwood. The state of the tree left quite a bit of spalting (fungus staining) throughout. The design is as simple as can be imagined. I lowered my standards and used cherry plywood for the back of the cabinet on the theory that it would almost never be seen. 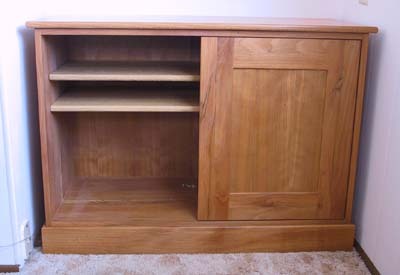 I also wound up using white oak for the two adjustable shelves inside, the stock of sycamore having run out completely. The doors were to have been solid sycamore, cut into two inch strips to make the best use of the dwindling supply of wood. This went well until I decided to route "V" grooves (9 on each door) over the glued joints to embellish the sparse design and to hide the inevitable mismatching of the wood. This went well enough until I made a mistake with the router and ruined one door entirely just two days before it was to be delivered. One high point of the project was the discovery of the clever ROLL-12 hardware made by Klein. This hardware fits into simple 40mm holes drilled at the top and bottom of the door and guides on simple saw kerfs cut into the cabinet body. The doors slide like ice on Teflon. The finish is General Finish's SealaCell to bring out the figure. Overall size is 42 X 19 X 30 inches.